Professionals from the aerospace, automotive and nuclear fuel industries, as well material science specialists, were at the demonstration to see the new automatic micro hardness tester in practice. Delegates were shown how to set up a programme and were taken through the machine’s range of functions for Vickers and Knoop indentation methods. Developed and built in Japan, the micro hardness tester is the latest model from Mitutoyo’s HM-200 Series. It is equipped with an exceptional optical system, which has an extended magnification range specifically designed for test pattern set-up using image montage. The new software interface, AVPAK-20, offers increased productivity and greater accuracy. Setting the scene for the day, Dr Phil Harrison, a Chartered Engineer and specialist in metals and ceramics, opened the seminar with a presentation on the ‘Uncertainty of Measurement’. He explained that although errors in measurement were unavoidable, there were methods that material scientists could implement, which would help them to record more precise and accurate data. Such methods include increased automation, quality instruments, better design, education and training. To register interest in future seminarsm please visit http://www.metallography.co.uk or contact Spectrographic on 01274 966 173 or email info(at)metallography(dot)co(dot)uk. Spectrographic Limited is a family-run business providing a comprehensive range of new and refurbished metallographic products, equipment and consumables for material science analysis and quality inspection procedures. 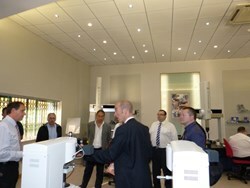 The company also offers specialist advice in material sample preparation, computer based image analysis and microscopic inspection. Founded in 1999, Spectrographic was set up and continues to be run by Managing Director, Paul Chippendale, who is a skilled metallographer with over 20 years’ experience. The company is based in Baildon, West Yorkshire, with demonstration laboratories in Bradford, Halifax and Sheffield. Spectrographic has recently embarked on a new partnership with The University of Sheffield Advanced Manufacturing Research Centre (AMRC) to set up a facility to support material science in advanced engineering. Spectrographic's customers are expert metallurgists working in the automotive, oil and gas and aerospace industries, and for higher and further education establishments in the UK and Internationally. Clients include Rolls Royce, BAE Systems, Siemens, Tata Steel, The University of Oxford, The University of Manchester, The University of Sheffield, DEKRA Industrial, Massey University (New Zealand) and The University of the South Pacific (Fiji). Founded in Tokyo in 1934, Mitutoyo is the world's leading manufacturer of precision measuring equipment. The company operates from more than 100 countries across the globe. This extensive worldwide infrastructure enables Mitutoyo to provide their customers, wherever they are, with access to local support, world-wide technical advice and logistical backup to keep their vital measuring equipment in effective and profitable operation. The company offers a huge range of products from micrometers, calipers and dial gauges to hardness testers, vision measuring systems and 3D coordinate measuring machines. Mitutoyo also provides comprehensive product support and specialist services such as calibration, sub-contract measurement and gauging technology. Machine-specific training is available for customers as well as general metrology (the scientific study of units of measurement) training courses for companies wishing to upgrade staff skill levels.